Minneapolis’ Westminster Presbyterian Church since 2002 has had a partnership with a Presbyterian-Reformed church in Matanzas, Cuba, a city of approximately 150,000 on the north shore of the island about 56 miles east of Havana. The existence of this partnership and my going on three Westminster mission trips to Cuba–November 2002, January 2004 and October/November 2007–have sparked an interest in learning more about Cuba and the history and politics of U.S.-Cuban relations. I already have shared some of the conclusions I have reached as a result of this personal involvement with Cuba and Cubans. Now I would like to share some reflections on religious life in Cuba after the Cuban Revolution of 1959. First, I give thanks to God and Jesus for the miracle of the survival of the Christian churches in Cuba. Over the 52 years of the Cuban Revolution, these churches indeed have been engaged in a struggle for survival. Many of their fellow Christians, including pastors, starting in 1959, fled the island to escape the negative aspects of the Cuban Revolution. The Cuban government expelled many foreign-born Roman Catholic priests who were seen as supporters of the pre-Revolution Batista regime and as opponents of the Revolution. The Cuban government since 1959 has controlled and severely restricted any construction of church property, which I see as a policy to control use of limited resources. The Cuban government in 1965-67 sent many Christians and others regarded as undesirable to forced labor camps in the Sierra Mastre Mountains at the eastern end of the island. The Cuban government in 1961 closed and prohibited Christian schools and confiscated their property. This included the well-known Presbyterian Escuela la Progressiva in the city of Cardenas, now known as the home-town of Elian Gonzalez. The Cuban government still permits very limited church access to radio and TV. 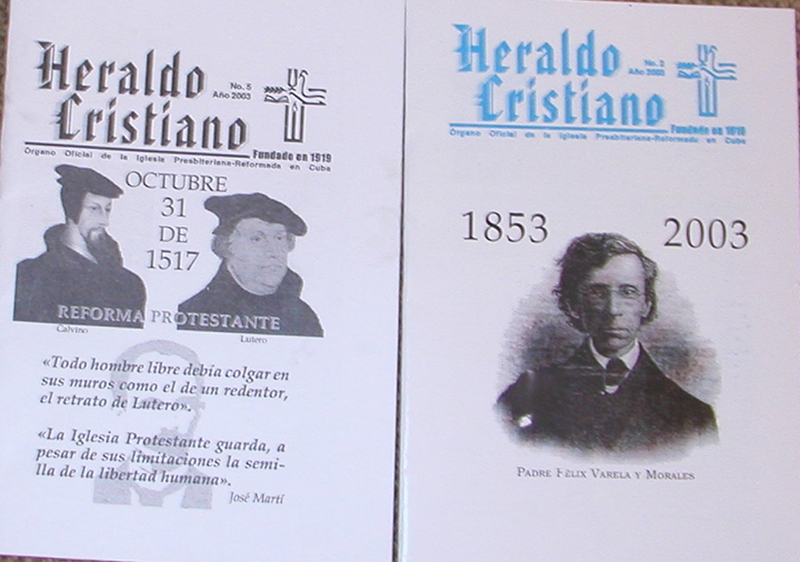 The Cuban government still controls and limits the publishing of religious materials. In fact, I believe, the only authorized such publisher on the island is our partner church. They print church bulletins and newsletters and other religious materials for most of the Protestant churches on the island. 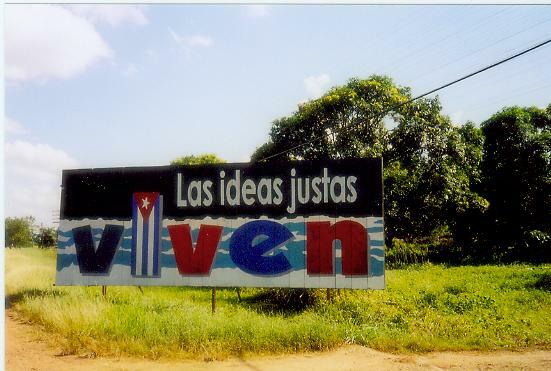 The Cuban government plasters the island with billboards proclaiming the virtues of the Revolution and the sayings of Fidel, Che Guevara and Jose Marti, the 19th century Cuban poet and patriot. In contrast, the Cuban churches apparently are not permitted to have any billboards with competing messages of the good life. Just compare our partner church with the next-door provincial headquarters of the Communist Party of Cuba. The church has virtually no identifying sign or message. The Party (CCP) has a bright red sign in its parking lot, and its building used to have a billboard with a Fidel quotation on top. The Revolutionary socialist or communist philosophy and polices since 1959 have resulted in a leveling down of the society economically. Thus, there has been no prosperous middle class such as we have in the U.S., to provide financial and other support to the Cuban churches. It, therefore, was not surprising for me to hear an active member of our partner Cuban church say that earlier she was not brave enough to be a Christian. 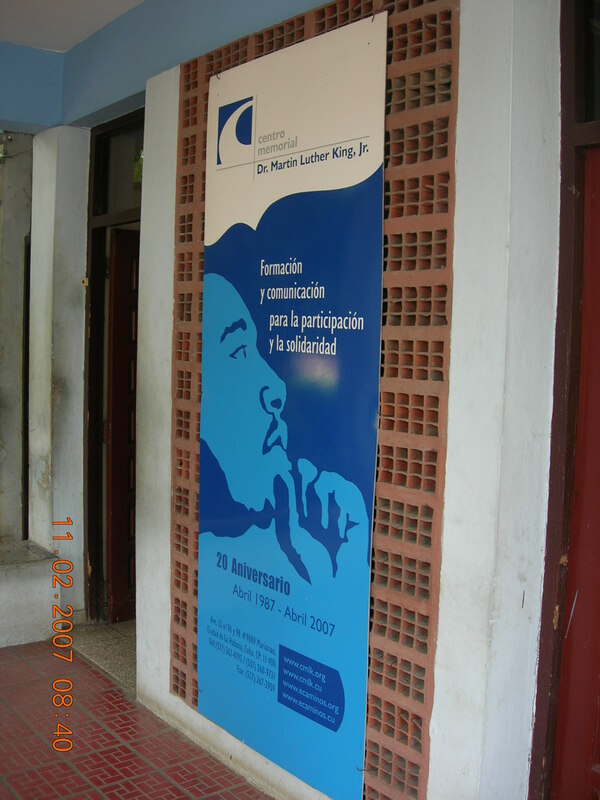 In 2007 we visited Havana’s Martin Luther King, Jr. Center which is affiliated with the adjacent Baptist Church. The church’s pastor, Raul Suarez, said that in 1984 he learned that Jesse Jackson, a candidate for the Democratic nomination for President that year, was coming to Cuba. Jackson said that Fidel Castro had invited him to discuss the status of 22 U.S. citizens then being held by the Cuban government. Jackson said that he also wanted an invitation from a Cuban church so that he could participate in a religious service in Cuba. Jackson asked Suarez, then Executive Secretary of the Cuban Council of Churches and Director of International Relations of the Cuban Baptist Church, if that would be possible. Jackson also gave Suarez a letter to provide to Castro on this issue. Castro responded that it would not be a problem even though atheism was the established “religion” in the Cuban constitution at the time. Jackson made his trip to Cuba in June 1984 and gave a speech to 4,000 students at the University of Havana with Castro in attendance. Afterwards the two of them and their aides walked a few blocks to the nearby Methodist Church where Jackson would be preaching. As they neared the church, Suarez heard a Castro aide say to Fidel, “Take off your hat, you are close to a church.” Fidel took off his hat. Suarez was surprised by this comment and Fidel’s response. Suarez told Fidel that the people in the Plaza de Revolution (supporters of the Revolution) and the people in the church were one and welcomed Fidel to the church. Fidel said, do not ask me to preach. There were 700 to 800 people in the church that day, including 35 church leaders and the Roman Catholic Archbishop (now Cardinal). When Castro entered the church, the choir extemporaneously cried, “Fidel, Fidel, Fidel.” Castro did make a short speech from the pulpit with a cross behind him. (Another Cuban pastor who was present told me that Castro obviously felt uncomfortable with the Bible on the lectern and awkwardly put his hands behind his back.) Castro praised Dr. King and Jackson and said there was a need for more exchanges between the churches and the government. Later that same day Suarez was invited to a dinner with Fidel and Jackson. This was the first time he had ever shaken Fidel’s hand, and Fidel asked him to come to the airport the next day to say goodbye to Jackson. Soon thereafter Suarez asked for a meeting of religious leaders with Fidel and submitted to Fidel a document of concern about the official policy of atheism’s limiting the space for religion. 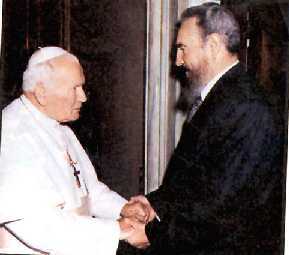 This resulted in a four-hour meeting between Fidel and about 14 Protestant leaders and the College of the Roman Catholic Bishops. Fidel expressed surprise at the Protestant ecumenicism, saying that when he was a boy in Jesuit schools, Roman Catholics disparaged Protestants. At the end of the meeting Castro made a covenant with these leaders: the churches will made an effort to understand “us” while Fidel and the Cuban Communist Party will make an effort to understand the churches. 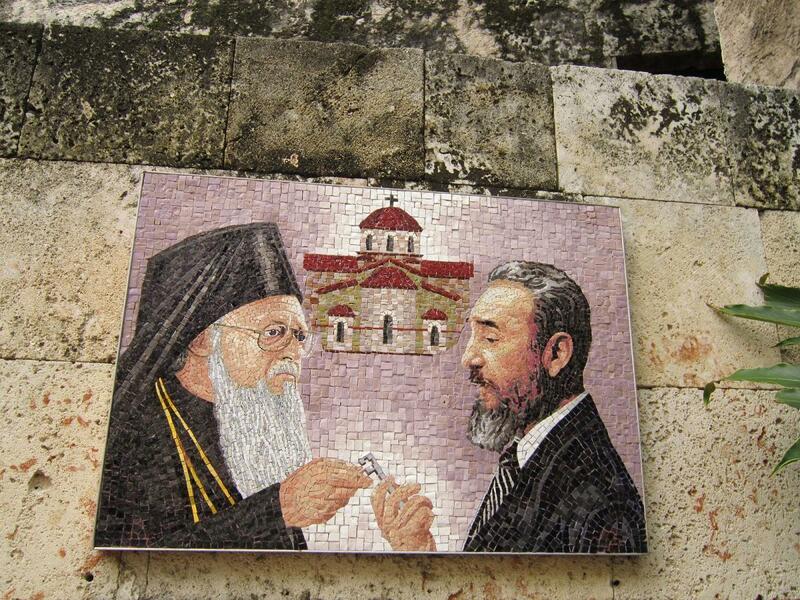 This agreement, said Fidel, should be easier for the churches than for the party. 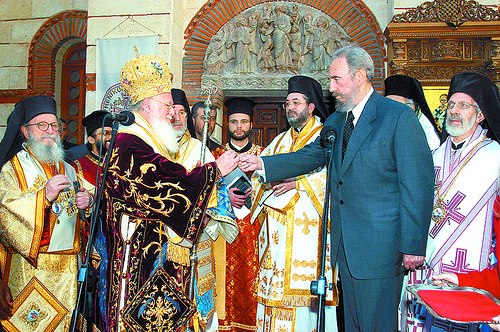 After the collapse of the Soviet Union there have been signs of a more tolerant Cuban policy toward the churches, some of which have already been mentioned: elimination of scientific materialism as the established “religion” in Cuba and of the Communist Party’s ban on religious people becoming members of the Party. In addition, Pope John Paul II visited Cuba in 1998 and celebrated mass before a huge crowd in Plaza de Revolucion (the site of many Revolutionary celebrations and long speeches by Fidel). The next year Cuban Protestants had a similar gathering in that Plaza. 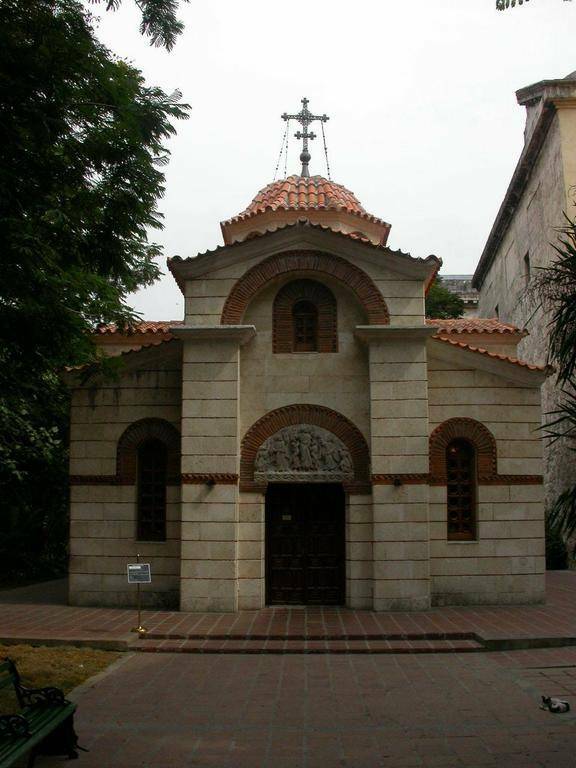 In 2004, during my second visit to Cuba, Patriarch Bartholomew of the Greek Orthodox Church was in Havana for the dedication of the new Greek Orthodox Cathedral that was paid for by the Cuban government. These developments, in my opinion, were real politik moves by the Cuban government to gain international allies to help combat el Gringos de Norte. In short, Revolutionary Cuba has made life very difficult for churches and religious people, especially from 1959 through 1989. On the other hand, there were no assassinations or disappearances of priests or other religious people who were opposed to the regime like what happened in El Salvador. Pursuant to statutory authorization the U.S. government and a quasi-independent U.S. commission have been releasing annual reports on religious freedom in the world that have been very critical of such freedom in Cuba. These reports will be discussed in a subsequent post. This then is the historical context in which Westminster initiated its partnership with the church in Matanzas in 2002, a relationship that has grown and become more meaningful for the people of both churches. A future post will discuss our Cuban partnership. See Post: Minneapolis’ Westminster Presbyterian Church (April 6, 2011). In the “Tag Cloud” at the top right of my blog, click on “Cuba” to look at the posts about Cuba.